"Ho-ho-ho, Merry Christmas!" While your child gets excited for days off from school, playing with new toys and eating sweets, keep her brain active with this challenging crossword puzzle of Christmas words. Your third grader will have fun figuring out clues with this colorful crossword puzzle all about Christmas! She'll even sneak in some handwriting practise too. This ugly Christmas sweater worksheet gets your kid to celebrate the good, bad, and ugly of Christmas cheer. Design and draw your ideal ugly Christmas sweater. 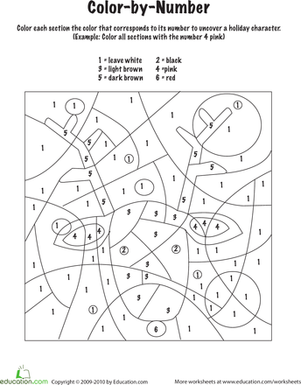 Celebrate the holidays with this festive reindeer colour by number coloring page.